I was aged 8 at the time of the the Bath Blitz, and I lived at 14 Bladud Buildings, The Paragon. My parents and I moved to Bath in September 1939 when I was nearly six years old. My father was a draughtsman in the Admiralty and he was moved from London to Bath, returning to London in 1947. We lived in a first-floor flat at 14 Bladud Buildings which is part of The Paragon. I attended the preparatory department of King Edward VI School which was on Lansdown; the main school was in Broad Street which I attended from 1943 to 1947. When the warning sounded on the night of April 25th 1942 we went down to the basement of our house in company with other occupants. The basement flat was occupied by a lovely couple, Mr and Mrs Jacques, and they tried to make us comfortable. When the noise of the bombing started I don’t remember feeling scared. I suppose I had no idea what was happening and I felt the protection of my parents. But grown-ups were certainly scared and I remember two men diving under a big table. My strongest memory is of emerging in the morning into a dust-laden atmosphere with the unforgettable smell of burning buildings. But I think I didn’t go far the next day when rescue operations must have been in progress. The following night, the second night of the Blitz, we spent in a large public shelter somewhere at the top of Broad Street. I remember the awesome sight of the Assembly Rooms burning the next day. 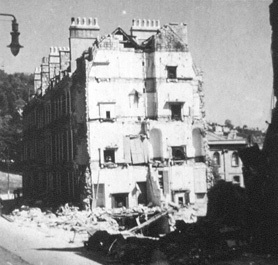 But the real tragedy of the blitz only hit me when I saw the smouldering ruins of our doctor’s house just up the road at 29 The Paragon. Dr Middlemass, her two sisters, and five others were killed by a direct hit with a further thirteen killed in the adjoining houses, numbers 28 and 30. It was impossible to clear the smouldering rubble of the tall massive Georgian houses and no-one knew whether anybody was alive underneath. It was said that knocking was heard for a day or two afterwards. The idea haunted me and I had to return to the site many times during the following days. After the second horrific night my mother refused to sleep in our flat and for weeks afterwards she and I spent the night in the cottage of a lovely lady, Mrs Ricketts, in Batheaston. I remember doing my homework there and getting up early to catch the bus back to the city for school in the morning. My father was often on duty at night in the Admiralty buildings at Ensleigh right on the top of Lansdown not far from the race-course. He was chief first-aider for the whole Ensleigh establishment and had to give first-aid lectures, which he hated. Some months later we moved from Bladud Buildings to a small and very damp cottage, Bella Vista Lodge, adjacent to the large house Bella Vista just down the hill from Mount Beacon. My father, a very keen and expert gardener, was very lucky to meet Commander Packenham, whose house at 5 Mount Beacon had been destroyed by a bomb but with the beautiful walled garden left largely unharmed. The two men came to an agreement whereby my father would maintain the garden in first-class condition and we could benefit from all the produce. So we had an abundance of fruit during the summer and plenty of vegetables throughout the year. This was wonderful in a time of rationing and shortages. I particularly remember the sublime figs from a large tree on the south-facing wall. It is very interesting that Mike Ruddock, in his memories piece, mentions both Dr Middlemass and Commander Packenham. I have one vivid memory of an incident before the Blitz. A friend (surname Hall but first name escapes me) and I were cycling in the country near Bath when a low-flying German plane came cruising up the valley. We jumped off our bikes and hid in the hedge, thinking that he might open fire with a machine gun. But with hindsight he was clearly carrying out reconnaissance in preparation for the Bath raids. Apart from the Blitz, Bath was an ideal place to grow up in. I learned to swim in the "twopenny hot" and everything was within walking distance. I enjoyed live music from the bandstand in Parade Gardens. I developed a love of theatre from brilliant productions at Theatre Royal. I enjoyed some excellent teaching in King Edward School (particularly French from Mr Brewer, Mathematics from Mr Eaves, but terrible History from Captain Jago). Above all in each of the 1946, 1947 seasons I saw three county matches in the Recreation Ground (pitches lovingly prepared by Mr Dando), getting in for nothing after school on weekdays. Although not a successful team Somerset was full of characters like Harold Gimblett, Arthur Wellard, Bert Buse who would chat with friends on the boundary. I also watched Bath Cricket Club every weekend and remember the sublime late cuts (the best I have ever seen) of Brocksom. I could go on but I would welcome any comments. The Broad Street car park behind the Royal York Hotel had a public shelter designed to accommodate 100 people. The photograph in the memory is of the gap left in the Paragon from number 28 to number 33 after the bombing. Number 29 would have been near the camera end of that gap. It is unlikely that deliberate knocking was heard, because if anybody trapped alive had been knocking, Rescue Squads would have been trying their hardest to get to them and they would not have given up while there remained an expectation that somebody was still alive. It was more likely to be the rubble settling.